NEW YORK CITY (WABC) -- Security remains ramped up throughout New York City Wednesday after explosions in the Belgian capital of Brussels killed at least 34 people in the airport and the subway. "The New York City Police Department is closely monitoring the situation in Belgium and is in close contact with our international partners and with the FBI," the NYPD said in a statement. The agency said there was "no known indication that the attack has any nexus to New York City," but it was deploying additional counterterrorism units to crowded areas and transit locations across the city "out of an abundance of caution." The Port Authority Police Department also increased security at its three area airports - John F. Kennedy, LaGuardia and Newark Liberty - and bridges, tunnels and bus terminal. On a windswept cargo ramp at Kennedy Airport Tuesday night, Port Authority Police and the NYPD Bomb Squad took one particular package very seriously. When a shipping crate passed through an X-ray machine, they spotted a tangle of wires that looked so suspicious, cops called in ambulances to stand by, just in case. In the end, it was nothing. But less than a day after the carnage in Brussels, it shows how tense things are here at home. All day at JFK and into the night at LaGuardia, heavily armed cops stood guard over ticket counter areas that in Belgium became soft targets Tuesday morning. But in the ultimate soft target, Times Square, the NYPD showed us a tool they say might have helped spot Tuesday's terrorists, before it was too late. Paulie is one of eight so-called vapor wake dogs set to graduate Wednesday. The dogs are trained not just to sniff bags and packages, but to sniff the air. They find explosive vapors that are undetectable to the human nose. 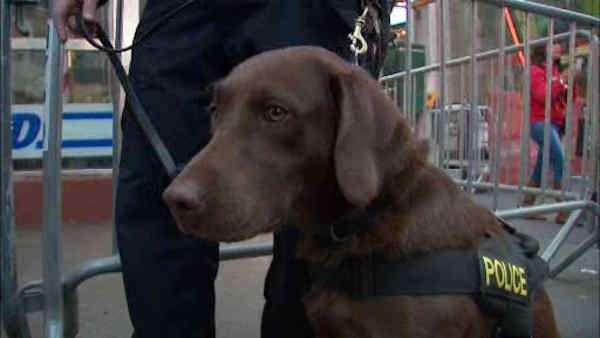 "The slightest trace of explosives on someone here, the dog will pick it up and indicate to the officer right away," NYPD Counterterrorism Chief James Waters said. Mayor Bill de Blasio and NYPD commissioner William Brattonrode the trains personally to show how safe they feel, as the NYPD starting flooding high profile targets within an hour of the attack overseas. "What you saw this morning and throughout the day if you were a terrorist was a massive show of force on the part of the NYPD," Deputy Counterterrorism Commissioner John Miller said. "What you saw if you are a citizen or commuter today was a large sign of reassurance and protection." An NYPD police car was seen parked outside the Belgium Consulate on the East Side, and there was increased police and National Guard presence at Grand Central Terminal and Penn Station. "The timing of this event allowed us to hold over the morning tours of duty on all of those units, so we were able to literally double the amount of officers available to us this morning," Bratton said. --Expect increased police presence and more bag searches at major New York locations, including subways and major areas, out of caution. --New York State Police will have State Troopers assigned to Penn and Grand Central Stations as well as the Queens Mid Town Tunnel and the George Washington Bridge. --The Port Authority is increasing its police presence at all of its airports, bridges, tunnels and the World Trade Center, as well as the PATH and Port Authority Bus Terminal. --The MTA is coordinating with New York State Police and the Port Authority to elevate its police presence at subway and rail stations in New York City, Long Island and Westchester. --The Port Authority Police Department is stepping up security at JFK, LaGuardia and Newark with heavy weapons. It also is using high visibility anti-terrorist patrols at the PATH and World Trade Center. --Nassau County officials said although there were no known threats to the county, Nassau County Police had intensified patrols on mass transit, critical infrastructure, and will increase patrols at some public events. --A federal law enforcement source told ABC News that an increased law enforcement presence is expected on all transit and rail systems in major cities throughout the United States.